Several of the dealers had antique clothes for sale; here are some photos of some of the pretty clothes I drooled over. The Montana Antique Mall isn’t a museum technically but it inspires me the way a museum would. I’m sorry the pictures in this post are blurry. 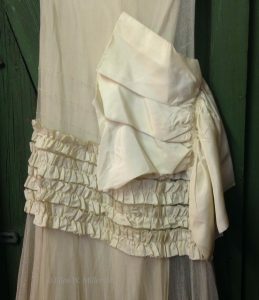 This lovely white dress was embellished with rows of taffeta, pinked on both edges and gathered into ruffles. Four rows of ruffles cover the sleeves. 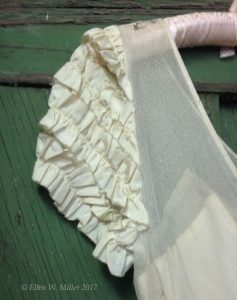 Another four rows of ruffles are placed at an angle, encircling the hips. Three large loops of taffeta are gathered and sewn to the side seam to form a bow at the waist. 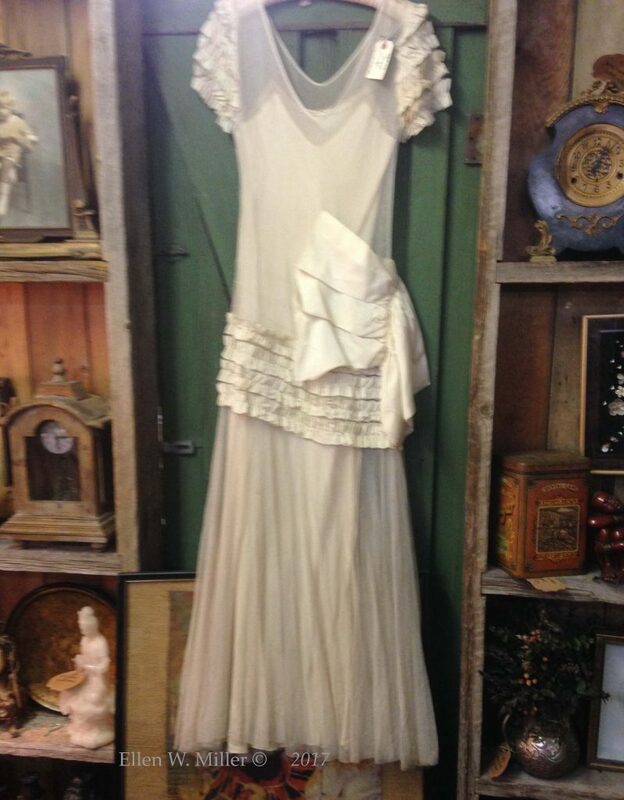 I think this was a wedding dress; can’t you just see the bride holding a bouquet of roses? Close up of ruffles and bow. 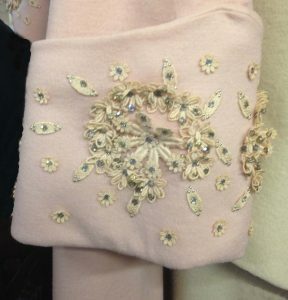 Close up of the ruffled sleeve. 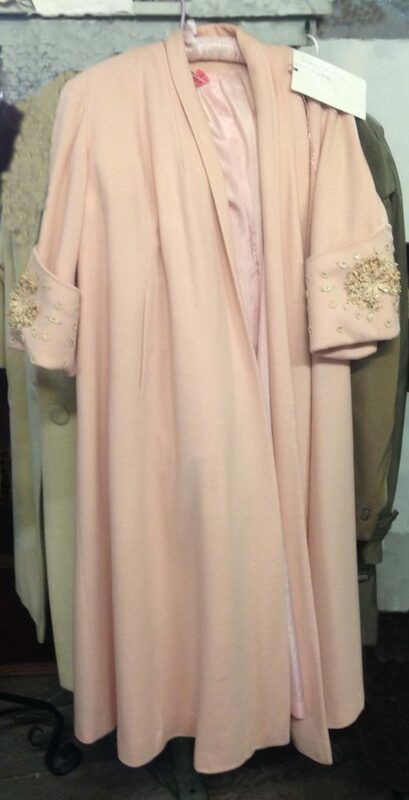 This lovely wool pink coat is decorated only on the ¾ length sleeves’ cuffs. There is central crotcheted motif of a daisy like flower, encircled by smaller flowers. Scattered further afield are smaller flowers and single leaves. All of the crocheted elements are held onto the cuff by small, prong-held, pale blue crystals and tiny silver nailheads. Imagine the ¾ length sleeves, with its wide sleeves and embellished cuffs meeting a long, shapely evening glove. The Opera, anyone? This lovely salmon dress is embellished with crystals, a gathered skirt and a handkerchief hem. 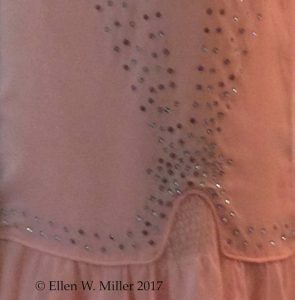 I love the pattern of crystals following the lowered waistline and then flaring up into the bodice, going to either side of the breast mound, with one group of crystals continuing all the way up and over the shoulder. Close up of the gathering and crystals.